A school located in the Grants-Cibola County School district and caters to students from middle school (7th grade) to high school (12th grade). As this school is on the edge of both the Acoma and Laguna reservations this school serves both communities. 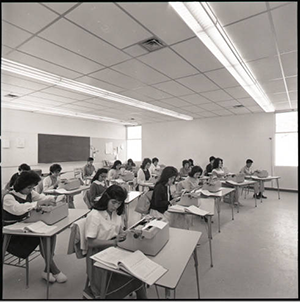 "Laguna-Acoma Jr. and Sr. High School, March 1963," photograph, Lee Marmon Pictorial Collection (2000-017-B17-F04-5). Center for Southwest Research, University Libraries, University of New Mexico. Chilcott, John H.; Garcia, Jerry P.
American Indian Education, Series I, No. 16, Final Report, accessed March 19, 2015.